Lot of 44 Pokemon cards including ultra rare, ex/lv. All cards are in near mint condition in a protective sleeve. Pokemon Absol EX Power Keepers Ultra Rare Holo Foil 92/108 Pokemon Sceptile EX 96/100 Crystal Guardians Holo Foil Rare. Pokemon EX Delta Species - Metagross. Pokemon EX Dragon Fronteirs - Dragonite (Holofoil). Pokemon EX Crystal Guardians Ultra Rare - Shiftry EX 97/100. Pokemon EX Crystal Guardians Ultra Rare - Swampert EX 98/100. Pokemon Diamond and Pearl Ultra Rare - Torterra EX 122/130. Pokemon Secret Wonders Holo Rare - Charizard 3/132. Pokemon Diamond and Pearl Ultra Rare - Infernape EX 121/130. Pokemon Diamond and Pearl Ultra Rare - Empoleon Lv. Pokemon Entei 34 Reverse Rare. Pokemon Sandstorm Ultra Rare - Gardevoir ex 96/100. Pokemon Base Set 2 Holofiol - Charizard 4/130. Pokemon Diamond and Pearl Ultra Rare - Torterra Lv. Pokemon EX Power Keepers Ultra Rare - Skarmory EX 98/108. Pokemon Diamond and Pearl Majesctic Dawn - Phione (Holofiol). 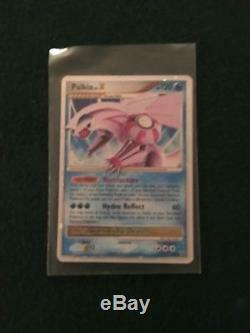 Pokemon Secret Wonders Holo Rare - Mew 15/132. Pokemon Diamond and Pearl Holo Rare - Manapy 9/130. Pokemon EX Holon Phantoms - Latios. Pokemon POP Series 1 Rayquaza 3/27 Rare. Pokemon Diamond and Pearl Great Encounters - Cresselia (Holofoil). Pokemon Diamond and Pearl Great Encounters - Latios (Rare). Pokemon Diamond and Pearl Great Encounters - Darkrai (Holofoil). Pokemon Secret Wonders Holo Rare - Entei 4/132. Pokemon Diamond and Pearl Mysterious Treasures - Celebi (Holofoil). Pokemon EX Deoxys Holo Rare - Deoxys 16/107. Pokemon Secret Wonders Holo Rare - Ho-Oh 10/132. Pokemon EX Emerald Rare Card - Kyogre 15/106. Pokemon Diamond and Pearl Great Encounters - Dialga (Rare). Pokemon Promo Card - Zapdos #23. Pokemon Secret Wonders Holo Rare - Suicune 19/132. Pokemon EX Holon Phantoms - Rayquaza. Pokemon Neo Discovery - Tyranitar. Pokemon Basic Holofoil Card - Machamp 8/102. Pokemon Base Set 2 Holofoil - Gyarados 7/130. Pokemon Fossil Holo Card - Lapras 10/62. Pokemon EX Hidden Legends - Jirachi Holofoil. Pokemon Secret Wonders Holo Rare - Lugia 14/132. Pokemon EX Legend Maker Ultra Rare - Arcanine EX 83/92. Pokemon Charizard EX Crystal Guardians 4/100 Delta Species Holo Rare. Pokemon Diamond and Pearl Great Encounters - Palkia Lv. 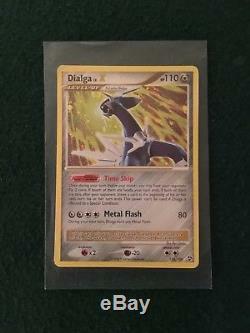 Pokemon Diamond and Pearl Great Encounters - Dialga LvX Ultra Rare Holofoil. 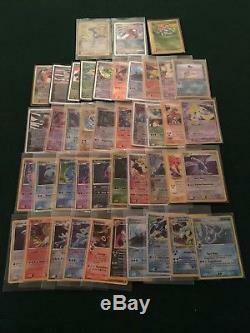 The item "LOT OF 44 POKEMON CARDS INLCUDING EX, LV. X, HOLOFOIL AND ULTRA RARE" is in sale since Friday, January 5, 2018. This item is in the category "Toys & Hobbies\Collectible Card Games\Pokémon Trading Card Game\Pokémon Mixed Card Lots". The seller is "pattdales" and is located in Poughquag, New York.